Gluten refers to a group of plant proteins found in grains, including the gliadin in wheat, hordein in barley, secalin in rye, avenin in oats, oryzenin in rice and zein in corn. When people with celiac disease, or CD, eat specific forms of gluten, their bodies mount an autoimmune response. Although the gluten in wheat, barley and rye triggers this reaction, the zein protein in corn is safe for people with CD. The Celiac Sprue Association, or CSA, specifically identifies plain popcorn as a gluten-free snack that’s safe for patients with celiac disease. When people with CD eat foods containing forbidden forms of gluten, their bodies identify those proteins as foreign objects and launch an attack against them. The attack damages the villi, small fingerlike projections inside the small intestine, and keeps them from absorbing life-sustaining nutrients. Since corn gluten doesn’t trigger this autoimmune response, people with celiac disease can eat corn and many foods made from corn, according to the CSA. Although popcorn is a safe food for a gluten-free diet, it may be flavored with ingredients that contain gluten. Caramel, for example, may be produced from barley malt that contains gluten, states the National Foundation for Celiac Awareness, or NFCA. 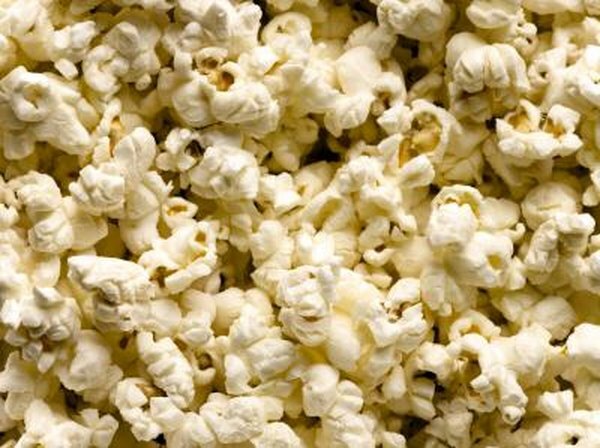 Beware of popcorn products flavored with malt flavoring, malt syrup, barley malt, barley extract, rice syrup or brown rice syrup, warns the University of Chicago Celiac Disease Center. People with celiac disease can safely eat popcorn that’s flavored with butter, salt, honey, non-buttered syrup, molasses, marshmallows, nuts, coconut or pure cocoa, says the Celiac Sprue Association. Herbs can also be a safe and healthy choice for those with CD. While popcorn itself is gluten-free, dangerous cross-contamination can occur during the cooking or serving process at home. Keep popcorn containers on separate shelves from gluten-laden foods, clean cooking surfaces carefully after each use and serve gluten-free popcorn in a separate bowl from gluten-containing treats.